By Megan Okonsky Search Engine Optimisation (SEO) Jun 25, 2018 Comments Off on SEO vs. 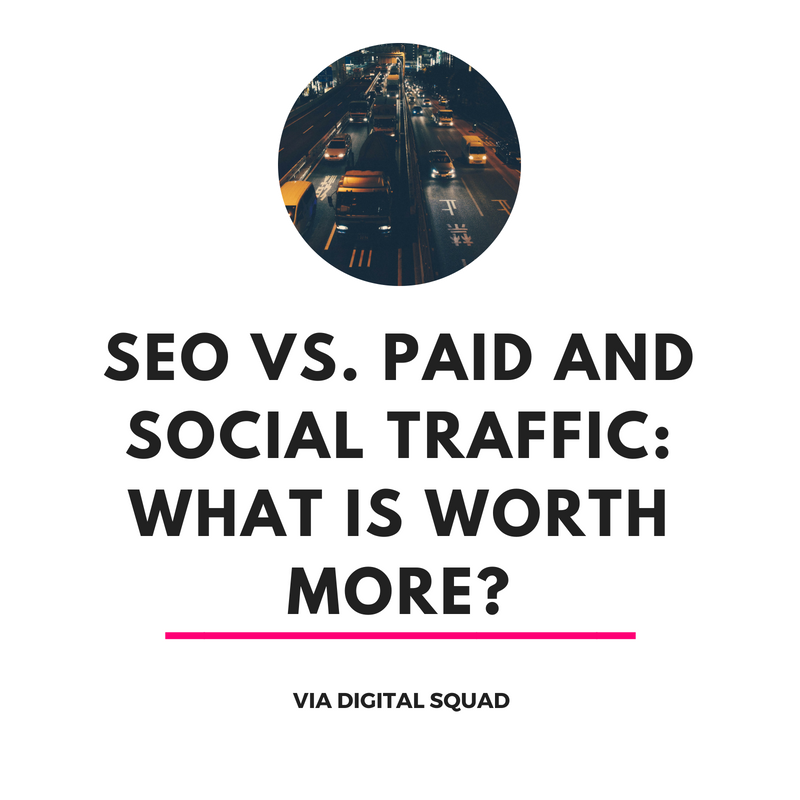 Paid and Social Traffic: What Is Worth More? SEO vs. PPC is a common matchup that you will see on blogs and in the mouths of digital marketers. Is it more valuable to optimise your website for organic traffic or to throw money into Google AdWords and have “a better” chance at ranking for specific keywords? Does user experience really bring in more sales, or are the resources used to implement SEO practices better off being put toward an advertisement? We wrote a blog post just last year on the subject, and came to the conclusion that both options are essential for your marketing strategy. The numbers tell the same tale. Marketers report that by using both PPC and SEO techniques, they can increase clicks by 25% and overall profits by 27%. Sounds good to us. So let’s go deeper into the PPC vs SEO argument. Investing in two different digital marketing strategies is going to give you different customer journeys, conversion rates, and overall sales. We’ll zoom in on this back-and-forth by looking at one metric: traffic. And when we talk about paid traffic, we’re also going to include paid social traffic. Like Google AdWords and SERPs, you can either create optimised social content and cross your fingers that you made all of the right steps to bring traffic to your social media profiles, or you can set aside a daily budget to create ads. Ads and promoted content are available across most social media channels, including Pinterest and LinkedIn. Generating traffic does not equate to generating conversions, increasing revenue, or boosting ROI. Not all traffic is good traffic. The average conversion rate for a landing page is 2.35%, after all. If you are a local coffee shop in Auckland, thousands and thousands of website visitors from Mexico are not going to help you boost in-store visits. If you are a wholesaler that ships coffee to Mexico, this traffic is going to be slightly more useful. There are ways to direct your resources to generating the right traffic to your website and calculating just how valuable this traffic is for your business. Let’s go back to the coffee shop example. If you want to increase local conversion, you will have to target a local audience through SEO or paid ads. This can be done in a few different ways. You can specifically focus on keywords that include your location (“coffee shop Auckland,” “brunch cafes Grey Lynn,” etc.) You can partner up with local businesses to write content and keep your strategy within a small radius. You can also adjust your AdWords or promotions settings to only target people within a certain area. Two out of three smartphone users want their ads customised to their local city or zip code; give these users what they want and encourage conversions by keeping it local. Half of all smartphone users who conduct a local search for a store will enter that store within 24 hours. Invest more in these ads to drive more conversions. If you look at your data and notice that your traffic is coming from unrelated keywords (for example, “coffee shop Melbourne Florida,”) you can implement negative keywords that prevent your ads from showing up in searches that aren’t worth your time or resources. One way to pit SEO traffic vs. paid and social traffic is to look at the conversion rates and the ROI for each channel. If your business is getting more out of your Instagram traffic than your website traffic, it’s a no-brainer: invest more in Instagram and keep the momentum going. SEO is often pitched as the “free” alternative to paid traffic. Your content organically appears on at the top of SERPs. But we all know that once you start to build and implement and SEO strategy, your work is not worth 0 dollars. These are the results, but you’ll also need the value of the effort that you put into your SEO strategy. How much time are you spending on the blog posts and eBooks that are driving conversion rates? How much time is your team spending on analysing and monitoring keywords? If an optimised landing page that is not promoted by AdWords generates X number of leads, for example, you can pit the value of those leads against the SEO efforts that you undertook to get the page to its spot on SERPs. These efforts could include A/B testing, content creation, the time it took to research proper keywords, etc. One of the advantages of PPC is the ability to calculate the value of a click or conversion. These numbers can be pulled from AdWords or other data that you are already using to measure traffic and costs. Social, on the other hand, presents a huge headache for businesses and marketers alike. We all know that a viral tweet is valuable, but what numbers can you attach to social media content to make this value clear to everyone on your team? There are extensive guides on how to best calculate ROI for social media traffic and efforts, but we will be brief. If your team is big on numbers, assign a monetary value to all of these types of engagements. How much is an exposure to 1,000 new social media users worth? 10,000? How much is a comment with 5,000 likes worth? Set up measurement settings on Google Analytics before your next campaign to track how often your social media channel converts visitors into leads or customers. If your social media channels are not liked to your analytics account, you will be missing out on a lot of key insights between your website and your social media traffic. Other resources for calculating social media ROI can be found on Hootsuite. Lastly, be sure to track costs of social (including the resources you are using to pay team members who are posting and responding to social media content.) If you have these numbers handy at the end of a campaign, you will be more likely to see how much return you are getting from engagement, conversions, and sales. As you can probably tell, analytics and reporting are key to determining where your traffic comes from, goes, and how valuable each visitor is to your marketing efforts and overall revenue. When you are analysing your data, ask yourself: Where are your website visitors located? What brings them to your website, and what makes them drop off before converting? Start each campaign with an in-depth look at your website analytics and the value of your current traffic. This information can be gathered with tools including Google Analytics, SEMRush, and other resources dedicated to helping you reach your traffic and conversion goals. Keep close tabs on how this traffic develops and changes with each campaign. A social media following doesn’t develop in a day, so choose a strategy that will help your traffic grow in the long run. Investing in a dying social media channel or a new channel that may “promise” to be the next big thing (here’s looking at you, Vero,) isn’t going to promote sustainable growth. An algorithm change (like the decline of business posts appearing on Facebook newsfeed) can make a big difference in the value of a social media channel, so stay on top of social developments and how it can affect your interaction and engagement. Our best tip? Consider Instagram. If your customers are on Instagram (800 million users are,) it’s time to start posting pictures and adding filters. Ecommerce businesses in Australia and New Zealand now have the opportunity to sell items directly on Instagram with Instagram Stores. Get into it. The data you need to analyse your traffic exists; now you just have to find it and read it. Prepare for your upcoming campaign by reaching out to an SEO agency that knows how to interpret and apply the data that you collect. SEO professionals know the value of traffic and know the secret of how to build traffic that actually converts. Get the most value out of your SEO efforts by partnering with a local SEO agency. At Digital Squad, we offer AdWords, SEO, and social media marketing services for the business who wants a full, effective digital strategy that produces long-term results. Reach out to our team for more information about your digital marketing options.